Last week I mentioned the sunburst mirror purchase, and ended up hanging it behind the sofa, even though for awhile I was planning on making or buying a large piece of art for that space. Even if it isn't the permanent home (and it very well may be the right spot), it's certainly an improvement for now. I know it's not a mirror, but it's close enough. I think Jan stole my vision via telepathy, so I'm both impressed and pretty mad (the "mad" part was a joke). I love this space. I keep magenta flowers around until they're brown... it's always been one of my favorite colors, just like lime green. I *heart* black and white geometric rugs, too. 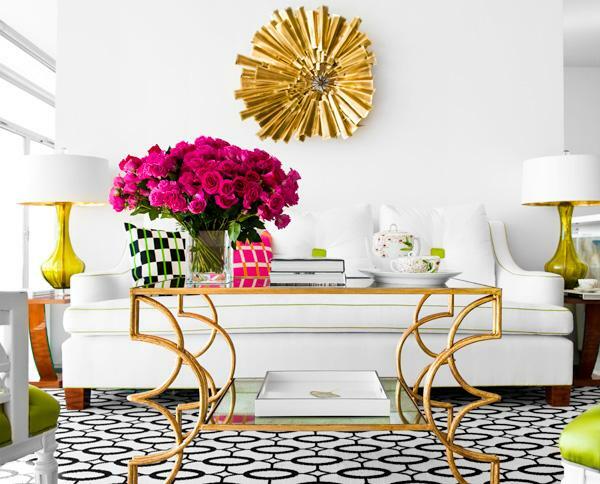 And if that's not enough, I've been considering a brass/gold glass coffee table for awhile. Is this a sign? She also stole my coffee table. It's really strange... like I'm not the only one on earth who has this idea. Okay, that's it. I'm getting a brass coffee table. It's interesting how the sunburst mirror fills a space with style more easily than so many pieces twice the size. It's also interesting how this post started out about sunburst mirrors behind the sofa, and ended up about brass coffee tables. Do you think I'm just seduced by the sunburst, or is it too small? Do you think interior designers are stealing my ideas before I have a chance to tell anyone, or do I need crazy-pills? What an incredible blog I have ever observed. Whatever we amassed data from the online journals, we should actualize that in every practical sense then no one but we can comprehend that right thing obviously. Here you can check quality custom essays online to having a brilliant help for your making works. Thank you for sharing! What a cute mirror.